Regular readers of and visitors to elobeatlesforever (elobf) might be aware that elobf will be ten (10) years old on Saturday 2nd February (Groundhog Day!) next year. 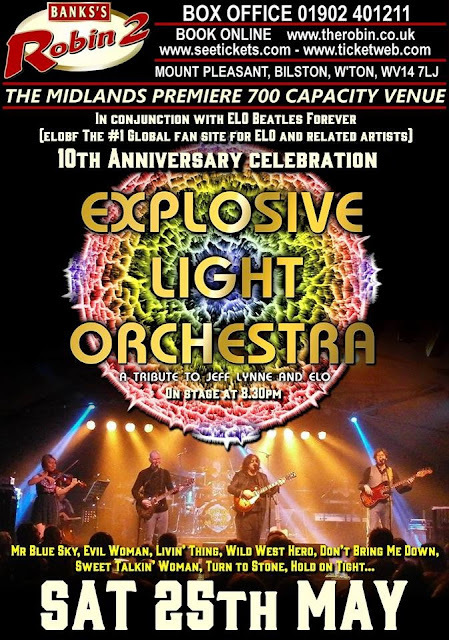 Yours Truly KJS has been thinking on ways to celebrate our 10th birthday and, thanx to Mike Hamblett at The Robin 2 and Robin Myles of Explosive Light Orchestra (ExpLO), we will be celebrating (somewhat belatedly) the occasion on Saturday 25th May 2019 when ExpLO arrive at the Bilston venue. elobeatlesforever (elobf) recommends Explosive Light Orchestra (ExpLO) and The Robin 2 to those enlightened folks who enjoy the music of ELO, Jeff Lynne, Roy Wood, Wizzard, The Move, The Idle Race, 'Brum Beat', The Beatles and related artistes. See you there? I wish I lived in England for this event. I know I would love it! Can't travel alone due to disabilities, plus I can't afford the airfare, etc. Early congratulations and good luck with the event!